We have replicated the fiberglass versionWe have replicated the woodenand nowfor the first time in history, we are replicating the exact Zelda Shield in Foam version. Made for the standards of the LARP (live action role play) industries, this authentic replica foam Zelda shield can also be used for cosplay, conventions or just plain pretending. 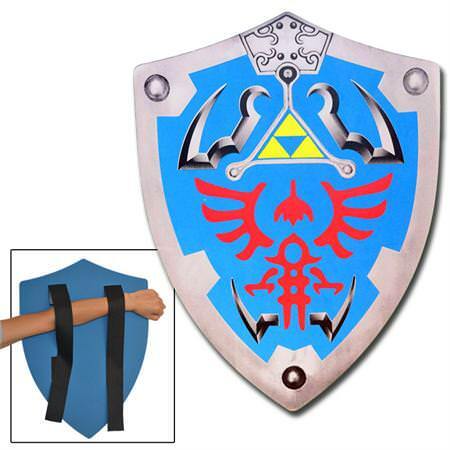 Constructed from high quality Polyurethane foam, this Zelda shield is fashioned to look like the real deal. Its so light; you can actually use it as a floating device in water. It offers high quality silk screen printing and featuring intricate details from end to end. This shield is part of our Junior Warlords Collection of high quality foam padded items that are great costume and its made perfectly safe for children- awesome products for both the young and the young at heart! The Hylian Shield is a large, adult-sized shield and bearing the crest of the Hylian Royal Family; a large red bird which is widely believed to be a phoenix above which sits the Triforce. The Triforce represents Triforce of Power, the Triforce of Wisdom, and the Triforce of Courage. The shield possesses two qualities that have made it somewhat famous; its ability to withstand fire-based attacks, and the fact that it is the shield of choice for Hylian Knights. Now you can own this rare piece of art right in your own home for a very affordable cost.